Do NOT forget your four-legged family members! Plan in advance what you will do to save them! 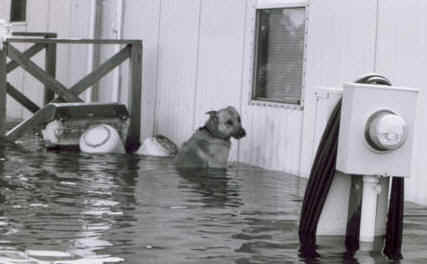 If it is not safe for you to stay at your home, then it is NOT safe for your animal! 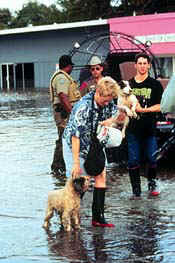 during a DISASTER, including Hurricanes. such as a waterproof tote bag or large plastic portable file box or large plastic tool box. phone number as well a phone number for an 'after hours' Emergency Vet Hospitals in your area. Make sure to have a First Aid 'book' such as the one listed. Call or go by your local book store. If they do not have it, they can order it. Call 24 hours a day from anywhere in the U.S.
Use caution when traveling with a pet! if left if a vehicle or on or waiting for a plane, or many other problems are possible. and also place a list in with your Emergency Supplies for your animals. Consider a MicroChip for your pet. Always have ID tags on your pets which have TWO phone numbers listed on the tag. only a very few that help animals. A disaster is not an excuse to abandon those for whom we are responsible. every bit as much as we do. then it is NOT safe for your animal!